Two self-driving minibuses began plying the roads of Helsinki this week — in real traffic. The small electric buses were developed by a French company EasyMile and can transport up to nine passengers. They are able to travel at speeds of up to 25 miles per hour, although they are restricted to seven miles per hour during their trial period. The buses are being used to move passengers between two busy public transit stations in the city’s waterfront Hernesaari district. A driver is stationed on board in case of an emergency. The project is part of Helsinki’s ambitious plan to make car ownership in the city obsolete within a decade. The city already has a very efficient public transport system, but it is also developing an on-demand mobility program, which would allow people to use integrated mobile apps to book and pay for any trip by bus, train, taxi, bicycle and car sharing. 1. Would you feel safe in a driverless vehicle? 2.The driverless technology is coming! Which driverless vehicle type do you think has the highest chances of becoming a reality and most useful? 3. 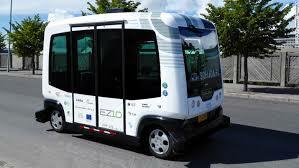 Helsinki is getting ready for the driverless technology. Do you feel that your city is ready?